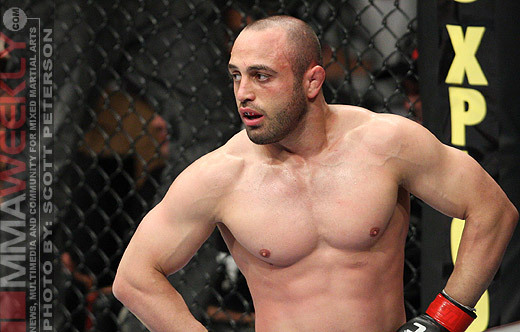 From the let’s try this again file, former ‘Ultimate Fighter’ runner-up Manny Gamburyan will meet Diego Nunes at UFC 141 in December. The pair were originally scheduled to meet at UFC 135 in September, but injuries put both fighters on the sidelines and off the card. UFC officials announced the pair had accepted the fight once again, this time at UFC 141. Manny Gamburyan returns to action after a close decision loss to Tyson Griffin in his last fight in June, as he tries to make his way back up the featherweight divisional ladder. Much the same as his opponent, Diego Nunes looks to bounce back from a loss to Kenny Florian in June and put his name back in the hat of featherweight contenders. Gamburyan and Nunes meet on the undercard for the UFC 141 show taking place on Dec 30 in Las Vegas with former heavyweight champion Brock Lesnar meeting former Strikeforce heavyweight king Alistair Overeem in the main event.